If you're like most people, walking into Brookstone is like walking into the fourth dimension. Or Disneyland, I can't decide which. Let's just call it a happy, happy place where all of our dreams come true. 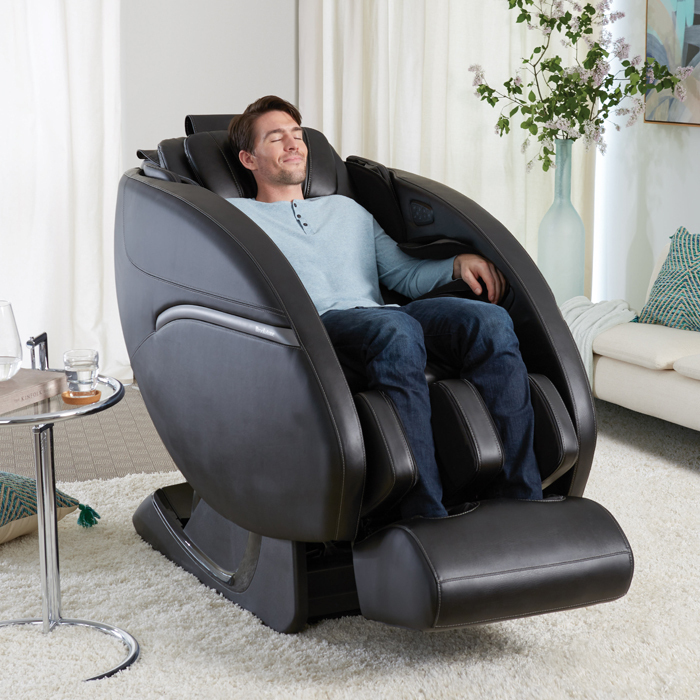 When it comes to massage recliners, gadgets, and devices, we know they carry some of the best including Brookstone massage chair line. It used to be worth a trip to the store just to "try out" the latest models. I know you know what I mean. But with today's technology, the overall reduction in price, and the cost of seeing a therapist regularly, you almost can't afford not to buy one. Here's a review and comparison of each model in the Brookstone product line. This is the closest you might ever get to feeling not only like an astronaut, but one that's getting one of the most therapeutic massages available while remaining perfectly still and weightless in time and space. This is literal nirvana. If you're in a hurry and want a quick stress-relieving rejuvenation break, opt for the quick session. You get a head-to-toe complete whole-body massage in just six minutes. If you have a bit more time on your hands and want to get lost in blissful shiatsu, choose from one of the 14 built-in auto programs that are specially designed for stretching, twisting, flexing, extending, soothing, or energizing. The computer scan will assess the curve of your body and deliver a personalized accordingly. You can target your entire body, shoulders, and neck, posture, back, or stress relief. There are programs specifically for night and morning. They employ clapping, Thai, shiatsu, rolling, and kneading. The powerful nodes are designed to knead deeply into calves, hips, and seat. The massaging system works in both an in and out motion as well as up and down to deliver a 3-D experience over the length of your spine. You can recline into a full zero gravity position in a single touch, relieving your spine, joints, and muscles from carrying any body weight or stress. This neutral position is the most healthful and beneficial for tension release. The "dynamic squeeze" function utilizes 50 air nodules to compress and squeeze legs, arms, shoulders, and feet to reduce muscle pain and improve circulation. The advanced L track system ensures your entire back body, all the way down and under your glutes is deeply massaged for maximum relaxation. You can adjust the width between the shoulders for an exact fit, and two rollers penetrate deep into muscles, emulating human hands. The intensity, width, air compression, and roller speed are all fully customizable, so you can make any adjustments needed to target the exact areas and level of pressure you need. The addition of heat for your feet, legs, and back is an option for loosening tight muscle knots, releasing stress, and improving the flow of oxygenated blood throughout your body. The remote control contains a backlit screen, so it's easy to view and change your settings, day or night, in the high or low light. One superb feature of this model is that it only requires two inches of wall space to enable full recline, so you don't have to worry about having enough space in your room. It comes with a two-year limited warranty, and there are additional service plans available for purchase if you want added benefits. You can buy a two-year or a three-year service repair plan that will cover parts and labor should anything break or malfunction. If you don't like the chair within 30 days, you can return it. Just make sure you save your receipt. And it's important to note that if the chair isn't defective, you will have to pay a restocking fee as well as the cost of shipping. We advise trying this out before you purchase, as the return fees can add up to about 500 dollars. If you're limited on space or just want more a recliner, this is a great option. It's compact, yet a full featured chair that reclines. The shiatsu massage is delivered via two nodes that penetrate deeply into your back to knead tired and sore muscles, for ultimate relaxation. It also employs tapping and adjustable rollers for improving circulation and blood flow, and soothing tight muscles and knots. There are four built-in programs to choose from, including a six-minute quick setting, which delivers a full body experience, all the way from your neck down to your thighs. 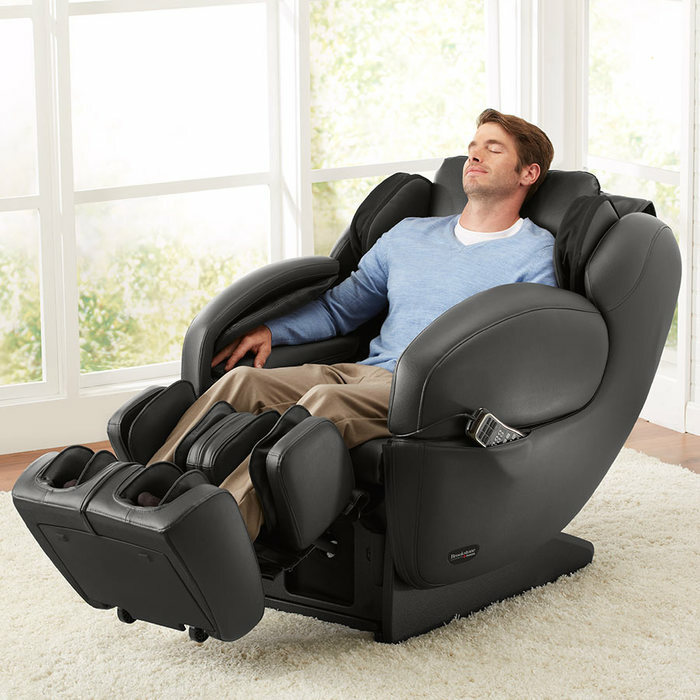 The relax setting provides gentle rolling and kneading in the reclined position. Energize utilizes both shiatsu and tapping, and is the highest intensity program. It's perfect for first thing in the morning. Stress relief is a combination of rolling, shiatsu, and tapping, designed to relieve stress in the reclined position. If you don't like or want any of the program modes, you can use manual mode by accessing it via remote control. There's a removable pillow pad for additional neck support, and the synthetic leather is easy to clean. You can add heat to the lumbar region to relieve tension in the lower back. The L-track system works to ensure your entire back and glutes are massaged. The rocker capability is a nice addition to the reclining. 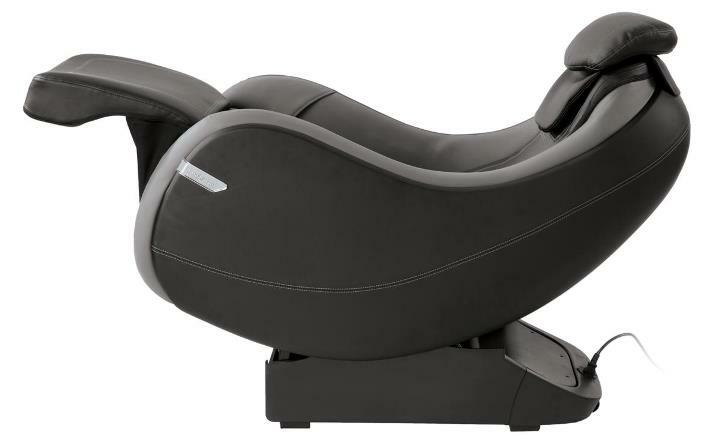 This advanced, best-selling chair is very similar to the 3D Zero Gravity, with a few added features. It also has 14 automatic massage programs for flexing, stretching, soothing, extending, energizing or twisting your muscles and limbs for ultimate stress and pain relief. The scanning technology assesses the curvature of your spine and ensures a customized massage tailored to your body. You can opt for full body coverage, or target posture, shoulders, and neck, stress relief, or back. The programs designed for day or night are for energizing and relaxing. The various techniques used are Thai, clapping, kneading, rolling, and shiatsu. The kneading provides a deep tissue massage into hips, seat, and calves. The system employs up and down and in and out motion, which is the 3-D action against your spine. The Energize 3D also utilizes the L-track system for fullback and glute coverage, as well as zero gravity positioning for complete spinal release. Two ideal features in this model are the integrated Bluetooth speaker system and the quick access bar on the side. The sound system brings soothing sounds for added relaxation. The quick access side panel lets you control and changes your settings without using the remote control. Anything you want to adjust or change is right at your side, easy to manipulate with the touch of a button. Less moving around equals greater rejuvenation. 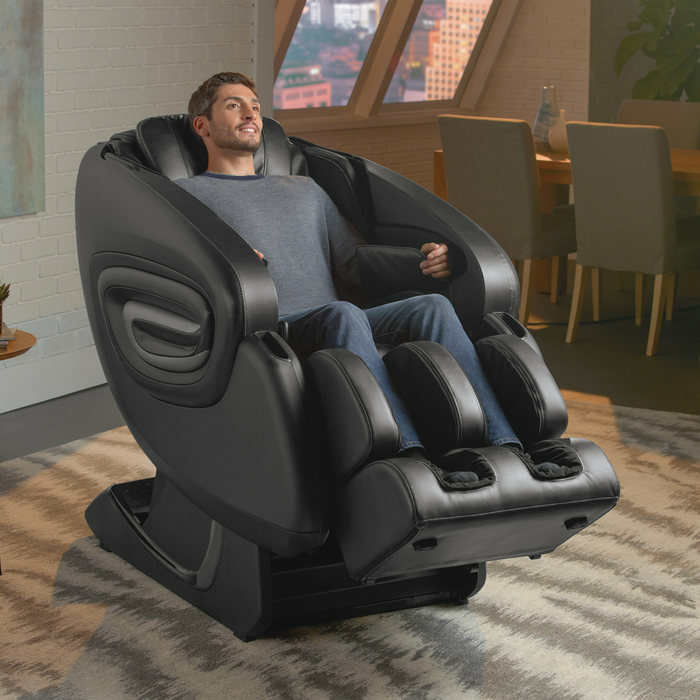 If you love the features and massage options in the Energize 3D and Recover 3D Zero Gravity, but want to spend just a little bit less money, or don't need quite the array or depth of options, this chair delivers. Instead of fourteen automatic programs, it comes with eight. You can opt for soothing, all air, stretch, sleep, back relief, energize, full body, or stress relief. It employs kneading with tapping, shiatsu, rolling, tapping, and kneading, for the full benefits of deep tissue therapeutic massage. These are excellent techniques for soothing sore, tight muscles and increasing relaxation. If you're in a hurry or want a fast way to start the day energized, you can use the quick setting for a full body massage in only five minutes. You get 42 airbags for compression squeeze, which is excellent for sore, tight shoulders, feet, legs, and arms. The body scanner adjusts to your dimensions and delivers a customized, targeted massage to your exact dimensions, and the L-track system works down your whole spine and under the seat. You can adjust the body area, speed, type, and width of the rollers to get just the intensity, method and combination that works for your specific needs. You can add heat to the lumbar for increased blood flow, and all settings are accessible via the remote control. If you've narrowed down your search to the Zero Gravity and want to add an updated look and remote, you can get both in the Renew 2 Zero Gravity. All the same settings as the Zero Gravity, you get the quick session for a whole body to revive in just five minutes, and eight auto programs built-in to target stress relief, soothing muscles, air only, sleep enhance, back relief, energize, or full body. The L-track delivers deep tissue massage from neck to hamstrings. The massage techniques are shiatsu, rolling, kneading, tapping, and kneading with tapping. 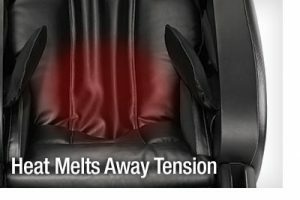 You can adjust the air compression level and recline to a full zero gravity position, relieving all stress from your spine. The lumbar area heats up if you want for added circulation and low back relief. The remote control is updated with an improved backlight and buttons, and the updated look and feel of the fabric goes well with any decor. A couple of years back Brook stone partnered with Inada to develop and release the Brookstone Signature chair. Manufactured in Japan, it combines physiotherapy, reflexology, and chiropractic to create a chair designed to relax your body and mind. It features 18 built-in programs, five for stretching, four targeted to specific points on the body, and nine automatic. It contains 76 cells of air for all-around, full-body coverage. It's designed with athletes in mind, as it's massaging and restorative capabilities are particularly good for cyclists, runners, other athletes, and for anyone on their feet all day. 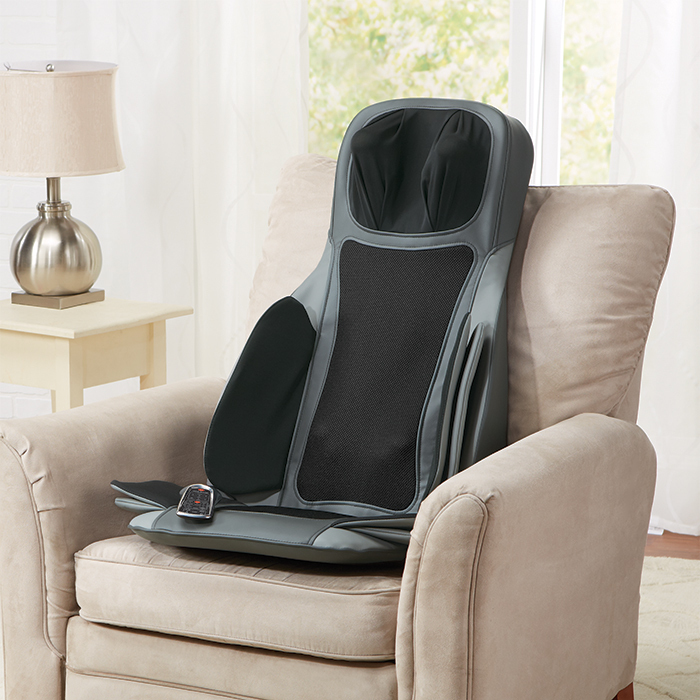 If you don't want to go full chair and prefer something a little more portable, you should explore the S8 Shiatsu Massage Seat Topper. 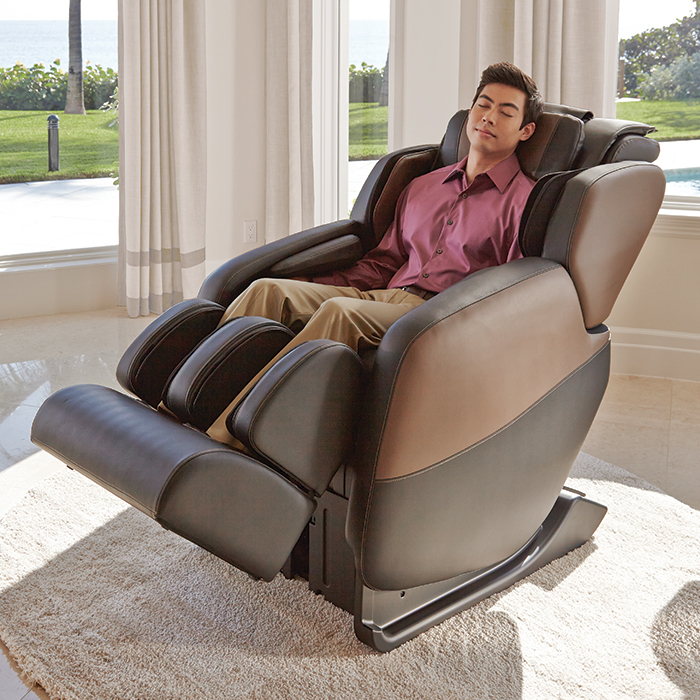 You can turn any comfy chair, at home or in the office, into a massage chair. It provides vibration and heat, as well as Shiatsu deep tissue massage. 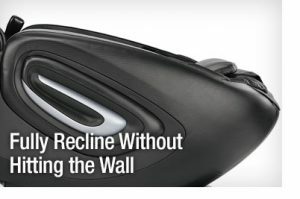 It comes with remote control and features squeeze technology for compression and increased circulation. 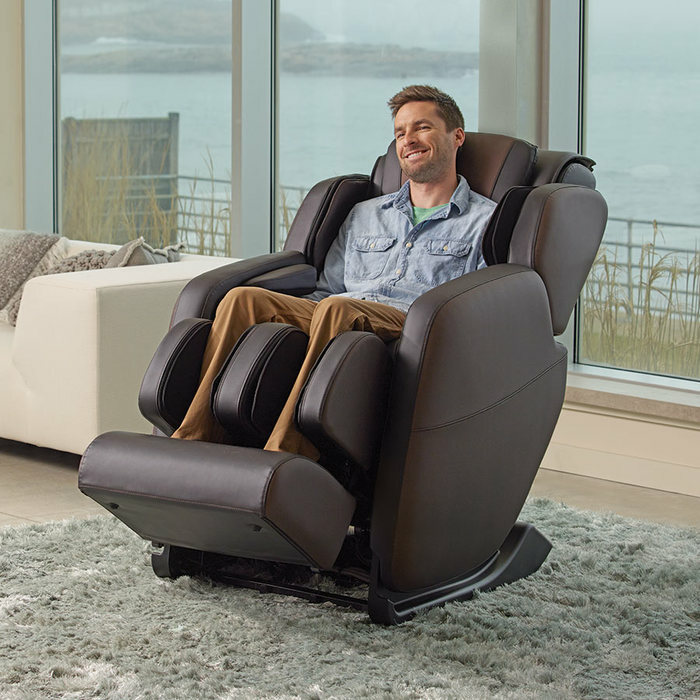 Whatever you choose, the benefits of purchasing a home massage chair provides relaxation and stress relief as nothing else can, save a home masseuse. You will be glad you made the leap when you're saving on medical bills and living a fuller & healthier life. 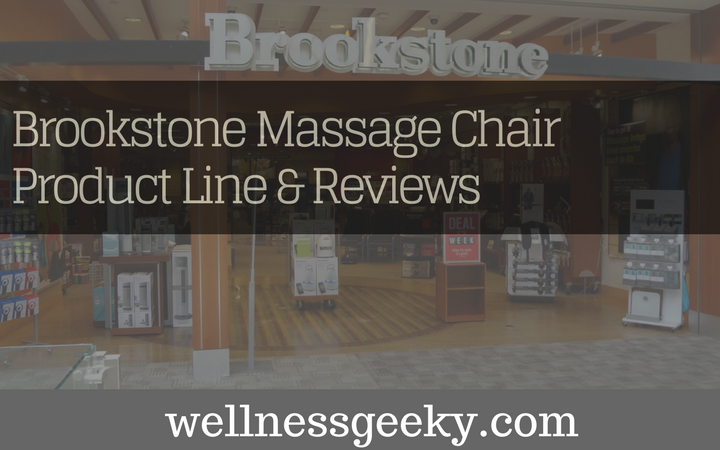 Whether you buy directly from Brookstone or happen to find one on sale, and sometimes discounted, from another retailer like Costco or Relax the Back or Amazon you can't go wrong with a beautiful, therapeutic, highly advanced Brookstone massage chair.